Wordpress has an amazing, thriving community of plugin developers, and no matter what you want to do with the website content management system, the range of available add-ons makes almost anything possible. The only trouble is that some developers have no problem charging for extras that are not always all that “extra”. Take, for example, WooThemes and their WooCommerce shopping cart plugin. WooCommerce is a fantastic system that generally offers a lot of the bells and whistles that people need to run a fully-featured store on their website, but it is also exactly the kind of plugin that charges for a lot of features thanks to the plugin’s extensions (yes, the plugin uses extensions–like plugins for a plugin). Want to handle advanced shipping? The table rate shipping extension is $199. 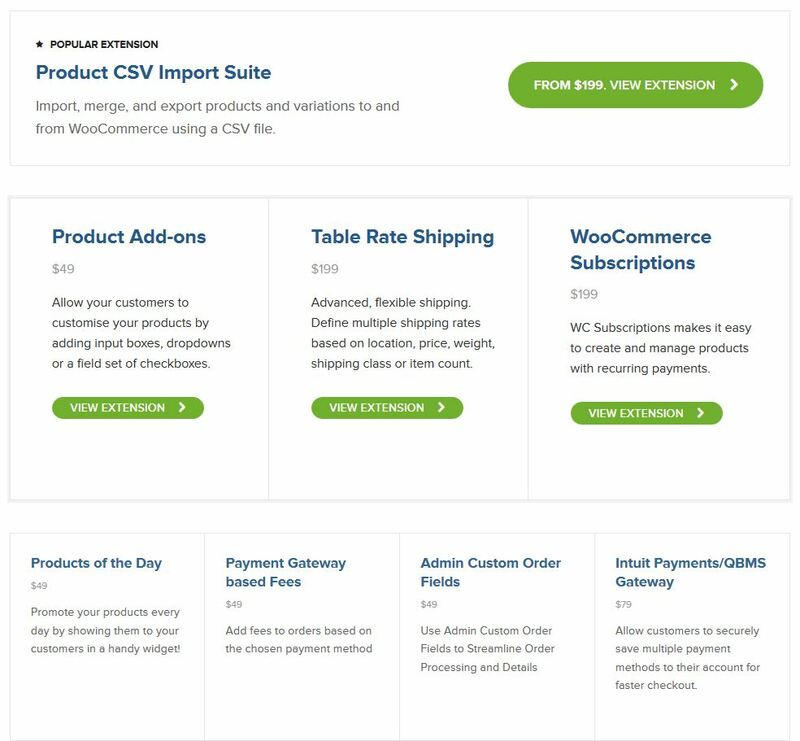 Need to handle subscriptions in your cart? That’s also $199. PDF invoices? $79. The trouble is that at least one of those add-ons is actually a core feature that most people actually need. Within the free plugin (and it is worth noting that the core functionality is provided as a free plugin), you can do a lot, including creating products, adding shipping charges, and you can send people to PayPal to pay for everything. But what if you want to export your sales out of WooCommerce to analyze or even just use to file your taxes? CSV exporting is $79. The thing is, I actually love most of what WooCommerce does. It’s a strong plugin for WordPress that is actually better than most of the alternatives, and it’s fairly easy to get it up and running, but when every little feature costs another $79, or more, I have to question if I want to support them. WPML is one of the best systems around for translation, and for a lifetime purchase, the total fee is $195 and you get every release they put out forever. It’s a fantastic system, and it’s feature-rich. Gravity Forms is another powerful WordPress plugin that lets you do anything you could ever want with a form, and all for the price of $199, including a year of support and updates. By comparison, if I had to package up just a few of the important elements that are available as WooCommerce extensions, we’re easily looking at over $500 for one year of support and updates. Considering they’re talking about an XML export, which contains all sorts of useless data that you don’t want in your accounting software, including orders that were never finished, and it also assumes that your accounting software can even open an XML file. I also can’t quite understand the tone the tweet takes, which seems to be a bit on the offensive, suggesting that their system does something users want, when it really, really does not. @pgsmarketing The ability to export into other formats has been built and the dev wants to charge for their work. Like most our extensions. The problem is that I am happy if WooThemes wants to make money off WooCommerce–because that’s what they’re in the business of doing–but I can’t swallow the idea that charging for every single feature is a bad model that follows Facebook’s incredibly flawed concept that they’re using in the news feed. On Facebook, if you post something as a person, or on a page you manage, only a portion of your friends or fans will see that post because Facebook wants you to pay to advertise that post, thereby actually reaching the full potential audience. That’s their sales model, and it’s a terribly flawed model that makes me question even using Facebook to reach people. If there are people who have requested to get updates from my page, shouldn’t they see what I post without me paying for it? This WooCommcerce situation is similar because all of the sales information is in front of you within the plugin, but short of writing it all down on paper, there’s no real way to use it elsewhere. That means that WooThemes is asking you to pay for the right to export the sales information that they’re effectively holding ransom for $79. If you’re really desperate, you can at least export your sales from your payment gateway, but if you’re using the built-in option, that probably means PayPal standard, and frankly, that’s another mess that I won’t get in to here. It’s possible, but it’s not pretty. So, what am I trying to get at with my criticism? I want to support plugin developers who are helping the community at large, and as someone who builds websites for people for a living, I want to be able to rely on plugins that work without any trouble that gets in the way. To me, this situation is incredibly greedy, and while I don’t intend to make a habit of being this critical of developers, I either have to hope that WooThemes will make some changes, or hope that other developers will step up with alternatives that make more sense. I also wanted this post to act as a small warning for those thinking of using WooCommerce on their own sites: the plugin is powerful and effective, but if need more than the basic features, you’re going to have to pay for them. Welcome to my first post offering Tips & Tricks for anyone looking for help with their Wordpress website. For the last 7 years I’ve been developing and creating websites using Wordpress as a content management system, and to date I have built more than 40 sites on that platform for individuals, organizations, and companies. Currently, I also run half-a-dozen of my own Wordpress websites, so I feel that I can safely call myself a Wordpress expert, especially with the use and installation of plugins. Overall, I have a stable of about a dozen plugins that I use on a number of the websites I work on because they accomplish a number of things for day-to-day needs, although it always depends on the specific site needs. For my first Tips & Tricks, I thought I’d keep it simple and offer up my list of five favorite plugins that are useful for almost any website, plus a few extra suggestions. These plugins tend to be very stable, are frequently updated, and offer some of the most requested tools that people want from their new website. Best of all, they’re all free, but you can also pay for pro versions of some of them for additional functionality. Jetpack: This is almost a no-brainer. 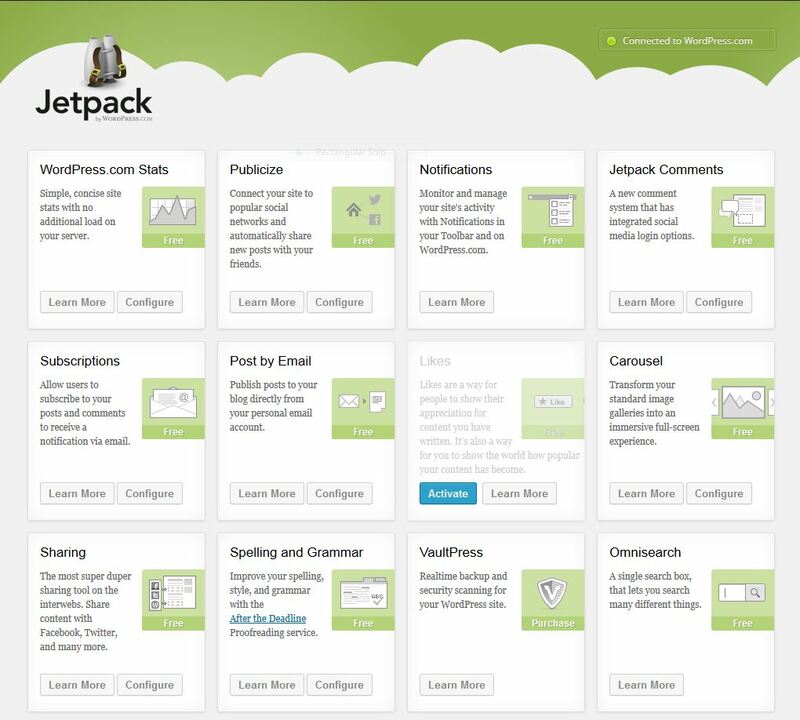 Jetpack was developed for WordPress.com users and offers a suite of features that are must-haves. Best of all, the plugin is powered from the cloud, so most of the work is handled from Jetpack’s servers, not yours. So what do you get for free? A stunning image carousel effect for your photo galleries, advanced commenting features, a mobile theme, social media sharing buttons, statistics, subscription options for readers, uptime monitoring, and a lot, lot more. This is a must-have for anyone with a website, and I generally use at least 5-10 of the features. Akismet [Paid options available]: For anti-spam protection, Akismet is a fantastic tool that protects your site from spammers, and for personal websites, the service is optionally free. For companies, or anyone looking to get better service in the form of support and faster spam checking, you can choose to pay $5 a month. Either way, this plugin is simple and easy to install, and invaluable when you start seeing hundreds of spam comments a day. WordPress SEO [Premium for $89]: Building a website for your company is a great first step, but it’s fairly meaningless if no one visits it, and that’s where WordPress SEO from Yoast comes in. The plugin has a lot of features, and it can take some time to setup properly, but it provides basic search engine optimization for your entire site, and helps make sure that Google and other search engines will find your latest posts and pages. Setting this plugin up may require the help of a professional, or at least someone who is willing to do some trial and error work, but there’s no point in creating your website if you’re not going to do a little work to make it more visible to potential clients or other people looking for information that you’re posting on your site. W3 Total Cache: For anyone running a website that seems just a little slow, W3 Total Cache offers tools that can speed things up, without doing much work on your part. After installing the plugin, you choose which features you want to turn on, and you should notice an almost instantaneous speed boost when browsing the site. This plugin has some features which are incredibly complicated, and anyone who doesn’t know a lot about WordPress or website development may feel a bit lost, but if you read up on using each option, you should be okay with activating most of the features. When in doubt though, getting a pro to help with this plugin is wise, and you should only need their help once to set it up. WPtouch Mobile Plugin [Premium for $49]: Although Jetpack offers a basic mobile theme option, WPtouch Mobile is a much better solution for making your website mobile-friendly if your WordPress theme is not responsive. Setup is fairly simple, and only requires a few minutes of work to get up and running. The free version of the plugin also offers enough features for most websites, but the pro version is only $49, so it’s worth considering if you need a few extra features or help troubleshooting plugin installation. MailPoet [Premium for $99]: Formerly known as Wysija, this plugin offers an easy-to-use email newsletter system that can be setup to automatically mail new posts to subscribers, or send out batch emails on a set schedule. As one of the few plugins to offer this in an easy-to-use plugin, MailPoet is an incredibly valuable tool for anyone looking to grow a subscriber base, and the newsletter templates can be customized to a basic degree with a WYSIWYG editor. Keep in mind that the plugin does not offer advanced customization of the newsletter theme, so you are stuck with a one-column design whether you buy the pro version or not. The Events Calendar [Pro for $65]: If your site needs an event calendar, this one does it all, and in a very attractive package. There are some drawbacks to using the free plugin, but for most websites, you can easily get by using it to provide a community calendar. One of the few drawbacks, at the time of writing this post, is that the plugin is not very mobile friendly, and it can be hard to customize the layout and design, but it’s still an incredible plugin. Gravity Forms [Only available paid for $39]: If your site needs custom or special forms, look no further than Gravity Forms for the mere price of just $39. Whatever you need your forms to do, Gravity can handle it, although some functionality may require additional paid add-ons. Out of the box though it supports multi-page forms, advanced fields, entry management options, and can be used for order forms as well. Available add-ons allow the plugin to work with Freshbooks, PayPal, and can also function for polls, quizzes, and user registration. Need help? Contact me for help with your website. I offer affordable rates by the hour, or as part of a package, depending on what you need.